Here’s part two of my semi serious look on how to taste wine for beginners, (part one here). If you’re in a tasting room surrounded by intimidating experts, and you don’t want to look like a complete newbie, here are my suggestions. The first and best advice I can give you is to openly admit you’re new to wine and still learning. Once you’ve done this you’re unassailable. But then if you go through the right moves (which you’ve practiced at home in part one) you’ll get full marks, even from the most conceited snob, so here we go. Once you’ve received you pour, hold the glass up against a light or a white surface and observe the color. Ask about the vintage (the year the grapes were harvested). If the wine is only two or three years old the color will be vivid. If it’s older it may have lost some color assuming a slight brown tinge. However don’t worry if you’re not seeing it, as different wines have different colors and ageing characteristics. At this point don’t say anything, it’s unlikely you’ll be asked to describe what you see. If compelled to speak, just state exactly what you do see. For example:” it’s a clear ruby red color.” You’ve admitted you’re not an expert so no one’s expecting you to get it spot on. The next step is the swirl and I’d say the most important moment of a first wine tasting. Give the wine a quick spin and while doing it ask if the wine has been barrel aged. Now you can say it has a bouquet (scent) of red fruits. You’ll be just fine with this one, as it probably does when talking of red wines. You can admit you can’t quite pin point which ones. Alternatively if it does remind you of something, say so. This a very personal aspect, and no one can really contest what the another can perceive. Again as a declared beginner you can’t be criticized, but you’ll likely be praised for noticing the fruit. If you can smell a certain sweetness you can add mature fruit and preserves, and you’ll really look good. If they told you the wine has been barrel aged, you could matter of factly state your getting a hint of spice. If it hasn’t been barrel aged, don’t add any more to what you’ve already said. Again if you just go through the moves without saying anything, it’s likely no one will ask you about your sensations. Just make a face as though you’re getting all there is to get! Now take a sip as per the previous lesson and concentrate on the sensations you’ve receiving. Whatever you do, don’t just wolf it down. This would ruin everything you’ve done so far. 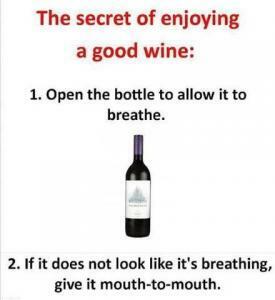 Take your time, roll the wine around for five ten seconds then swallow. With red wines the first thing to observe is the puckering sensation. Did you find it pleasant, or was it excessive and did it bother you? Now observe if the wine is acidic, bitter, sugary or dry, and how do these sensations take you. Do you like them or not? At the end of the day that’s what it’s all about. 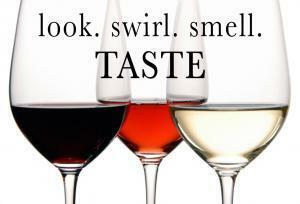 You either like what you’re tasting or you don’t and it’s the same for everyone. • No one knows everything about wine. • Don’t be afraid to ask “dumb” questions. • Wine is to be enjoyed not intellectualized. • Expensive doesn’t necessarily mean better. • Don’t trust very cheap either. • Beauty is in the eye of the beholder and in his taste buds. • Don’t be afraid to experiment. Or if you’re ever in Tuscany, why not take a Tuscany wine tour with me?